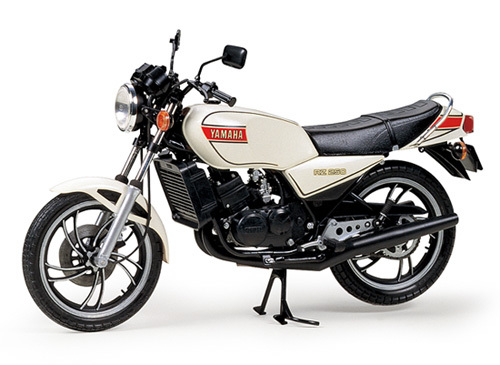 【 Yamaha's 2-Stroke Masterpiece 】　The Yamaha RZ250 was released for sale in the summer of 1980 and quickly became a best-seller in the 250cc-class of motorcycles. Its exciting styling and performance, which were in line with Yamaha's TZ bikes, made them very popular. Also like the TZ, the RZ250's 250cc 2-stroke, 2-cylinder engine was water-cooled and the bike was also equipped with Yamaha's unique monocross rear suspension. 【 About the Model 】　★1/12 scale plastic assembly kit of the Yamaha RZ250. Length: 174mm, Width: 73mm, Height: 100mm. ★Semi-pneumatic synthetic rubber tires feature realistic tread patterns. ★Overall form including engine and radiator have been accurately reproduced. ★Vinyl tubing included to depict brake and meter cables, etc. ★High-quality Cartograf decals included for both a black and a white bike. The information on this page is current as of February 2, 2012.